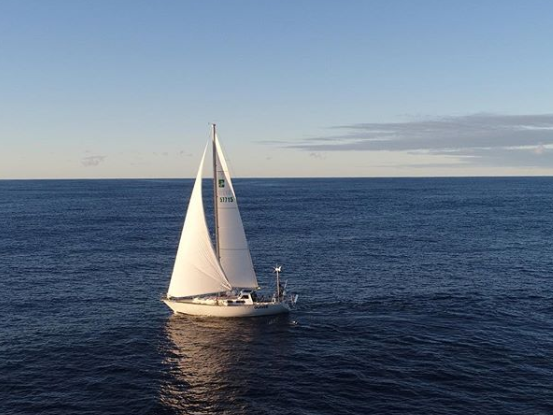 s/v QUIVER is officially underway on her global surf chasing odyssey! 17 days and change, and around 2,170 miles since leaving Kauai, QUIVER is moored inside the lagoon at Majuro Atoll; the most populated island in the Marshall Islands. The passage itself was great! The boat worked well, weather was helpful, all systems worked, I ate very well and also caught a lot of fish. At the end of the day though, 17 days alone on a small boat gets tedious after a while, and so the arrival into Majuro has been made that much more special. Also, Kristen again arrives in just an hour and a half and we will be able to explore Majuro, and possibly the atoll next door. She is only here for six days however, so will not be joining for the cruise. I am beyond stoked to be cruising again and have already met several cruisers whom I connect with. There is a lot of knowledge to take in and learn, and that’s what I’m again reminded by. Sure, i’ve done a bit of sailing, but i’m still a rookie cruiser compared to these old salts. Also, there is a lot of local knowledge to learn about cruising the Marshalls. My initial impressions of the Marshall Islands and the people are very positive. This place is rad, I can’t wait to see more of it! I will write more as I get settled in. I came here with an initial plan of going to Alinglaplap Atoll to surf, but have found out that due to the surf lodge and the quality of the surf, the local fee is $250 to visit the atoll. Basically, the local government realizes that foreign yachts will pay $250 to come surf the atoll. I’m undecided on how I feel about that. Due to the people i’m meeting and things i’m learning, I think I may be sailing northwest to a very remote atoll called Likiep Atoll. It’s out of the way, but in this journey i’m on, LIkiep is calling to me. I would then have the option to stop in at Alinglaplap, or Kwajalein Atoll, on the way out. 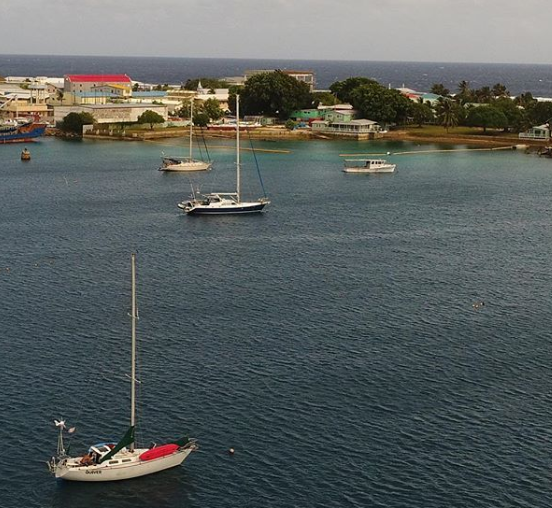 I am waiting on a couple of packages in the mail, the boat needs a bit of work, Kristen is visiting, and it’s nuking windy right now… so i’ll be staying put in Majuro for at least another week. I have been here 4 days right now. After Kristen is back home and the boat is ready to go and the wind lays down a bit, I will likely head out. For the time being, I am enjoying meeting local people, finding local adventures and working on things I need to work on. Two people informed me of a surfing wave, near the bridge, on Majuro Atoll during my first day here. On day 2, I unpacked the mini bike and rode to the wave to scope it out. The next day, (yesterday), I took one of the super cheap taxi cabs to the bridge and surfed the wave solo. I ended up meeting an American, who stopped while driving to watch me, who lives here and is looking for a surfing partner. Also, another cruiser and an arriving crew want to surf and Kristen arrives…. so we could have a full line up at the bridge this week! I had not seen anyone surf the wave when I surfed it, and I found it to be a decent wave that is probably pretty reliable. Also, it is protected and side-offshore to the wind, so it was very surfable even in nuking tradewinds. I hope to surf the bridge many more times before I leave here. I am incredibly amazed that on the most populated island in the Marshalls, I found a wave on Day 2, with no one on it, and then surfed it, again with no one on it. On an island with no surf! There are waves everywhere and that’s the point of the trip. I have now heard repeated rumors of another wave up by “Rita” or something, not far north of here, easily accessible by taxi cab. I am very compressed for time here with this good wi-fi. Much more to come. Aloha from Majuro and so many mahalos to all who supported me and the journey, and showed love to us when in the islands. Mahalo nut loa, or as they say in the Marshalls, Komol Tata (thank you very much).